Husum has a lot more to offer than sea dykes and fresh air, but they belong to Husum like a fish belongs in water. A trip to Nordstrand (15 mins by car) is as rewarding an experience as an excursion to St.Peter-Ording. Although at a distance of 45km somewhat further away, this North Sea spa at the western tip of the Eiderstedt peninsula with a beach of 12 km length and 2 km width and its dunes and salt marshes will leave a memorable impression on any visitor. 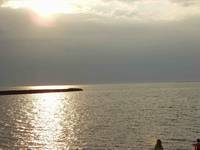 A bicycle ride of only 15 minutes will take you to Dockkoog, the Husum Lido. NordseeMuseum at the Nissenhaus in Husum: The museum exhibits archeological finds from the Wadden Sea, provides information about dyke construction, land reclamation and coastal protection and describes the everyday life on the islands and Halligen, part of the domestic culture of the North Frisians. In addition the visitor will find a presentation about Rungholt, the legendary settlement which perished in the storm tide of 1362. Husum Castle: Husum castle has developed into one of the most significant cultural centres on the west coast of Schleswig-Holstein and has a lot to offer to its visitors.You can visit the former state rooms and get an impression of the life of the residents in times past. Four special exhibitions held throughout the year present mainly contemporary art from the region of Schleswig-Holstein. The castles provides the background for extensive cultural activities including concerts,, lectures and performances of local plays. The Theodor-Storm-House: This was the residence of the poet Theodor Storm from 1866 to 1880. Today many of the poet’s possessions and works are on display in rooms that have mostly been preserved or restored to appear as in the time of his residence. The Maritime Museum: The Maritime Museum Nordfriesland exhibits ships and ships’ models dating from the Middle Ages to the present day providing an insight into life on and with the sea. The main attraction is the hulk of a Frisian merchantman from the 17th century. It was uncovered in the mudflats near the village of Uelvesbüll in 1994 and had to be submerged in a sugar solution for two years for conservation before it could go on show in the museum. Naturschutzzentrum Wattenmeer: The exhibition detailing the extent of nature conservation projects carried out in the Wadden Sea National Park located in the Nationalpark Haus at the end of the inner harbour is definitely worth a visit. The many facets of the natural habitat of the Wadden sea is depicted in a lively and informative manner. The Ostenfelder Bauernhaus: Das Ostenfelder Bauernhaus ist das älteste Freilichtmuseum Deutschlands. Begründet wurde es als Museum im Jahr 1899. Es bietet den Besuchern einen Einblick in die bäuerliche Lebenswelt. Man lebte auf engem Raum zusammen und alle Arbeitsabläufe waren genau verteilt. Alleine oder mit einer Führung kann man das Gebäude erkunden und viele bäuerliche Geräte kennenlernen, die damals zum Alltag auf einem Bauernhof gehörten. The Ostenfeld Farmhouse is the oldest open air museum in Germany. It was established in 1899 and offers its visitors an insight into the daily life of the farming community in bygone days. People lived in cramped conditions and the daily tasks were shared between them. You can explore the building on your own or take a guided tour to find out about the various farm implements which were an essential part of farming life in those days. The newly refurbished Husumbad provides fun for the little ones and a sense of well-being for the adults. Apart from exercising in the swimming pool you can pass a few pleasant hour in its generous sauna, experience refreshing hydrotherapy according to the Kneipp method, unwind in one of the comfortable rest areas or take advantage of a relaxing massage. Well maintained and clearly signposted cycle paths guide you through the attractive countryside of the marsh and through picturesque villages. What can be nicer than to enjoy the fresh air and sea breeze? We keep two bicycles ready for your use. Halfway between Hamburg and the island of Sylt you come across the Multimar in Tönning where you can explore the secrets of the Wadden Sea. It is an interactive discovery centre and aquarium which invites you into the wonderful world of the Wadden Sea National Park. The historic Nolde house was once Emil Nolde’s residence. The artist himself designed it in 1927 and the style is reminiscent of the Bauhaus architecture of the 1920’s. Nolde deliberately chose this architectural contrast to the low, thatched Frisian farmhouses of the surrounding area. The rooms on the ground floor retain the original furnishings and can be viewed from outside through the windows. They are arranged in their alignment to follow the course of the sun. During Nolde’s liftetime each window offered a magnificent view of the garden. Nolde’s studio was also located on the ground floor. Today his religious paintings are exhibited here. Immediately above the studio lies the hall of paintings. Former living rooms on the first floor have been converted to cabinets to display examples of Nolde’s graphic artworks. Gottorf Castle lies on an island at the end of the Schlei fjord and is home to the two state museums of Schleswig-Holstein. The collections of the Museum for Art and Cultural History covers the period from the Middle Ages to the present day. The Archaeological Museum acts as the archive for 120,000 years of local history and is also the showcase for the latest research. Five further museums as well as research institute, the Centre for Baltic and Scandinavian Archaeology (ZBSA), belong to the foundation. 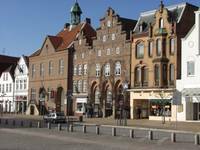 In a prominent urban location high above the theatre you find the Museum of Flensburg. With its exhibition space of 3,000 sq.m. 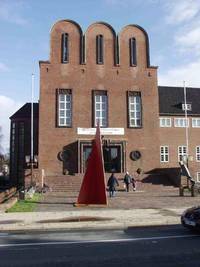 it is one of the largest museums of Schleswig-Holstein and offers a comprehensive insight into the art and cultural history of the Schleswig region of the period between the 13th and 20th century. Together with the ‘Old Cemetery’ and the Christiansen Park the two Museum buildings from an attractive ensemble in the urban landscape. Located among the dunes, right behind the dyke, the fun pool and water park offers you more than 1,000. sq.m. of water surface. With its various swimming pools, rest areas, black-hole water slide and large choice of catering options the spa offers recreation and fun for the whole family. Pure water from the North Sea, a varied sauna area with a garden in the dunes and relaxation rooms with a panoramic view round off the experience. After a friendly "Moin Moin" on entry you will be offered a cup of tea, which you should enjoy before venturing further in your search for a special souvenir of your time in Husum. There isn’t anything you couldn’t form out of Nordstrand clay, it seems, from canldholder to complete tea service. The small Dutch inspired town of Friedrichstadt is one of the most favourite Tourist destinations in the region - despite the small population of only 2500 inhabitants. The town was established in 1621 by religious refugees from Holland. Even today the townscape is dominated by canals and the stepped brick gables of the Dutch Renaissance. The whole town has been protected by a preservation order and appears like an illustration of a Dutch town from a picture book. The ferry operators will take you to the fascinating world of the North Frisian islands, large and small. On board ship you will experience nature in a special way, like getting a close-up view of basking seals. The sea breeze makes time spent on the water particularly health-giving with its iodine and salt rich air. 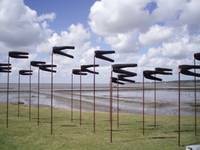 On the island of Föhr you can visit the new museum "Kunst der Westküste", which exhibits art of the continental North Sea coast between 1830 and 1930. The environment around the island of Pellworm is unique in the world. With a little bit of luck you will be able to see vast flocks of birds during your crossing in the months of April/May and August/September. Brent Geese, Red Knots, Bar-tailed Godwits, Lapwings and Plovers fly in magnificent formations over the Wadden Sea. A boat trip on the North Sea is a very special experience for both adults and children. An outing to catch shrimps and trips to the sandbanks to watch the basking seals are just as exciting as an excursion to the islands.